For years I subscribed to Cooking Light but these days I have a love hate relationship with it. Some months I treasure the magazine and other months hardly anything in it appeals to me. In addition I find their books to be hit or miss. Right now there are two Cooking Light books on the market, one a keeper, the other a loser. 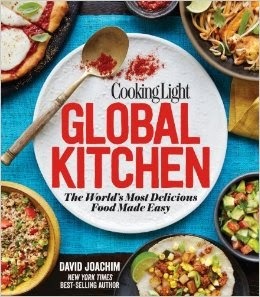 True to its name, Cooking Light Global Kitchen shares recipes from around the world. There are 150 recipes, 120 of which came from the magazine and another 30 that “fill in the gaps.” They all fit within the magazine’s guidelines for nutrition, ease and speed. The author/editor David Joachim tapped many chefs to help with the recipes and the results are impressive. The recipes may not be the most authentic but they are certainly user friendly. There are recipes from East Asia and India, Southeast Asia and Australia, The Middle East and Africa, Europe and Eurasia, South America, North and Central America. Many of the recipes take classics in a new direction like tabbouleh salad with chicken or a salad nicoise with seared tuna. And frankly many seems like improvements on the original such as lobster rolls freshened up with shaved fennel and citrus. I like that there are photographs on every page, for every recipe. I’ve bookmarked Quinoa Pudding, Cape Malay Curry (with warm spices, buttermilk, beef, peppers and apricots) Quick Lamb Kofta with Harissa Yogurt Sauce, Champagne Browned Butter Chicken and Fennel Cured Halibut Gravlax. Bottom line? KEEPER especially if you're looking for healthier international recipes. You could find most of these recipes online or in the magazine, but this it is convenient to have them curated this way. 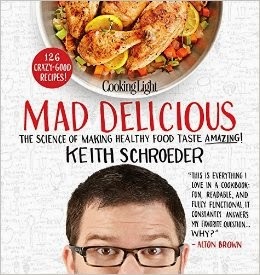 I was very excited to hear about Cooking Light Mad Delicious:The Science of Making Healthy Food Taste Amazing, but I’m rather disappointed with it. My issues with the book, I’m going to just give you just a few, start with Culinary School Chicken. It’s a basic roast chicken recipe. But one of the very first instructions says “Rinse your chicken under cold running water. Allow to air dry or pat dry with good quality paper towels. Use the cheap ones and eat paper.” Uh I have a better idea. DON’T EVER RINSE RAW CHICKEN! Sorry for shouting but the author really should have known better. This is just bad advice. Rinsing does nothing but spread bacteria and is widely discouraged. Next in the Lower East Side Brisket recipe there is a visual tutorial called Step by Step: Creating a crusty exterior. Basically it says season the meat with spices, heat the oil until hot and brown the meat. Really? That seems pretty obvious. The author uses potentially hard to find ingredients like sorghum syrup, espelette pepper and Turkish red pepper paste, all without suggestions for substitutions. The book also has instructions for making your own sriracha sauce which will keep for a week to 10 days in the fridge. I don’t know about you, but I’m not going to use 2 cups of sriracha in 10 days. Sadly I just didn't find the recipes all that compelling. All in all the book was a good idea, but it misses the mark. Bottom line? SKIP IT Science geeks will be disappointed and newbies will be overwhelmed. Disclaimer: These books were provided to me for review purposes. This post contains affiliate links.